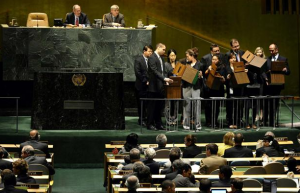 Each year, the General Assembly carries out elections for a number of individual posts and for bodies within the UN system. As elections are a perennial occurrence for the Assembly, many are even assigned the same item number in each year’s annual agenda. They may even occur around the same time each year, though there is no definite relationship between the Assembly’s agenda and its calendar. Roughly a third of the elections for this current session have been scheduled and one has taken place. The Credentials Committee, which confirms the credentials of the members states’ permanent representatives, was elected by the Assembly when it convened on 13 September. Nassir Abdulaziz al-Nasser, the current President of the General Assembly, was elected to his post under item #4 of last year’s agenda. This current item #4 refers to the election of the President of the 67th session – who will be from Eastern Europe, by the way – sometime next June. So despite being listed in the single digits of this session’s agenda, what this item actually refers to will be one of the last items of business that the 66th Assembly takes up. election of members to the Committee on Programme and Coordination, to the International Law Commission and to UNEP’s governing council, on 16 November. Several other elections will be scheduled in the interim, including two members to the Organizational Committee of the Peacebuilding Commission, as the terms of office for those elected commence on 1 January 2012. The remaining elections will take place either prior to the Assembly’s recess on Tuesday, 13 December 2011 or some point in 2012 as determined by other agreements among members states. Subscribe to Global Memo to stay informed on these and elections in other multilaterals as they are scheduled and take place.